Brous Blades has created an affordable import line of some of their most popular models. 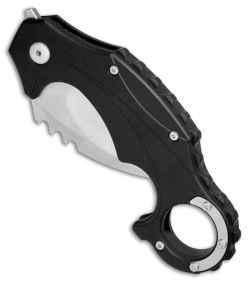 This Enforcer model is outfitted with a satin finished D2 steel blade and a black contoured polymer handle. The Enforcer was the first folding Karambit design from Brous Blades and it became an instant hit. With this design, Jason created a wraparound-style handle that accommodates forward and reverse grips equally well. The handle consists of sturdy, skeletonized stainless steel liners, a notched gears backspacer, and 3D machined polymer scales. The D2 steel blade comes outfitted with the Brous Bearing System for smooth and fast deployment. Pick up an affordable Brous Blades design with the Enforcer Import Line. Polymer handle construction with skeletonized stainless steel liners provides a lightweight, EDC build. D2 tool steel blade provides excellent wear resistance and cutting performance. Item includes a stainless steel pocket clip for secure tip-up pocket carry. Karambit is good and at least mine came set up for the left hand which was great as I didnt have to change the set up to my off hand for EDC. 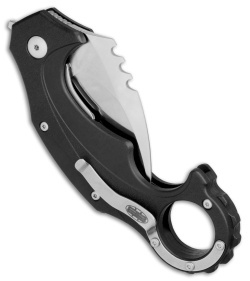 Makes a great backup/control tool and wears easy, solid lockup and good weight. 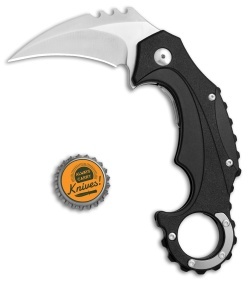 If you are going to carry a karambit and something else, this is def a good if not great option. Not giving it a 5 star because it makes a poor impact tool, other wise it met all expectations brilliantly. This Karambit is rough in the hand out of box, I had to get the Rat tail file out with some sand paper to smooth out the finger hole, more for the part that hits your middle finger in fighting position and other edges as well, it hurt my hand and I'm a Knife person. I love the D2 blade it's well fitted on the Knife as for the Flipper it's junk, very hard and far up on the knife, the wave on blade works great when deployed from pocket and now it feels good. I like it, Now I own two, after working with it it's just right. I hold a Black Belt and trained with Knives and the Bow four years.